Of all pouring type curries my favourite one is the Moru curry/ Pulissery. I used to prepare many variation of this using vegetables like Kumbalanga, Kaya, Chena, Vellarikka..etc. 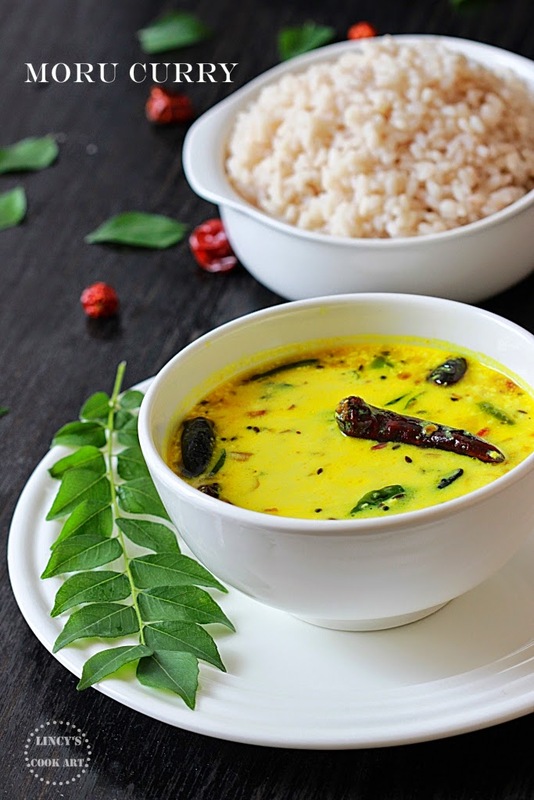 It is an essential curry for Onam Sadya and also for any vegetarian meals served in Kerala. I eat a stomach full when ever this curry is prepared. My taste buds can't get enough because of it's unique taste and I end up eating more more and more. I love to eat this curry, especially if prepared for lunch & later when the same is used at the time of dinner. The curry tastes good with full of its unique flavours. Finger licking good traditional curry from Kerala cuisine. On summer days I used to make this curry very often to keep cool down the body. It is an easy to churn out curry within minutes. As it has no coconut in I could very well say, that it is a healthy curry. Chop the onion in to small roundels or if you use large onion cut them into small pieces. Cut the green chillies and finely chop the ginger and garlic; set aside. In a blender jar add the yogurt and blend twice to get a uniform paste without any lumps. Heat oil in a pan and add the mustard seeds; once it splutters add the fenugreek seeds and jeera; cook till the fenugreek seeds colour turns golden brown. It should not a get deep dark colour which makes the curry bitter. Now add the dry red chillies and curry leaves. Fry them in oil till it becomes crisp. Add the chopped onion and green chillies and fry in that oil on medium flame. Once the onion becomes translucent add the chopped ginger and garlic and reduce the flame to low; cook till the onion and ginger garlic turns slightly brown. Add the turmeric powder and red chilli powder (if you wish) I do not add red chilli powder because the heat from the green chilllies and ginger will be enough for the curry. Mix well and add the yogurt with in a second to avoid the turmeric from burning. Add one cup of or more of water according to the thickness of the yogurt to dilute the curry and add some salt. Mix constantly well with a ladle; once the mixture gets heated up switch off the flame. Do not allow the curry to boil as it tends to split due to heat. Note: You could use roasted fenugreek seed powder and jeera powder too for this curry instead of seeds which could be added with turmeric powder.